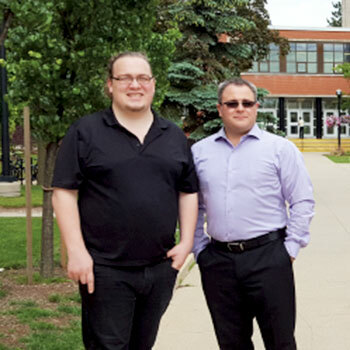 Michael Lisetto-Smith, manager of Study Skills and Supplemental Instruction at Wilfrid Laurier University, and Mynt Marsellus, a student leader in supplemental instruction and writing support, were both recognized by the Learning Specialists Association of Canada (LSAC) inaugural awards program. Lisetto-Smith, a founding member of LSAC and the International Consortium of Academic Language and Learning Developers, is the first recipient of the LSAC Distinguished Professional Award. The award was developed for an LSAC professional member who demonstrates leadership in program delivery and development of innovative learning supports. During his eleven years as a Laurier learning strategist, Lisetto-Smith has built in-person, online, and course-embedded supports focused on study skills and supplemental instruction for all students. Through the LSAC Student Award, LSAC recognizes a student who has excelled in learning-skills programming, services, or research at their institution. Marsellus was selected for his significant impact on student learning at Laurier through his work as a supplemental instruction leader, senior mentor, time-management coach, and as a writing tutor. Study skills and supplemental instruction programming at Laurier enhances student academic life through the support and promotion of proper learning strategies and study skills. A variety of forms of peer-led course supports are available to help undergraduate and graduate students succeed academically. Laurier also offers customized student-success programming for Indigenous students, athletes, and preparatory programs for mature learners and transfer students. The Learning Specialists Association of Canada is a voluntary, national association for professionals who focus on the application of learning theory in higher education. By offering instruction in learning strategies and study skills, LSAC members support and further the educational goals of students, faculty, staff and school administrators. More information about LSAC can be found at www.learningspecialists.ca.